Liquid water runs down canyons and crater walls over the summer months on Mars, according to researchers who say the discovery raises the chances of being home to some form of life. The water flows could point Nasa and other space agencies towards the most promising sites to find life on Mars, and to landing spots for future human missions where water can be collected from a natural supply. Some of the earliest missions to Mars revealed a planet with a watery past. Pictures beamed back to Earth in the 1970s showed a surface crossed by dried-up rivers and plains once submerged beneath vast ancient lakes. Earlier this year, Nasa unveiled evidence of an ocean that might have covered half of the planet’s northern hemisphere in the distant past. But occasionally, Mars probes have found hints that the planet might still be wet. Nearly a decade ago, Nasa’s Mars Global Surveyor took pictures of what appeared to be water bursting through a gully wall and flowing around boulders and other rocky debris. In 2011, the high-resolution camera on Nasa’s Mars Reconnaissance Orbiter captured what looked like little streams flowing down crater walls from late spring to early autumn. Not wanting to assume too much, mission scientists named the flows “recurring slope lineae” or RSL. Researchers have now turned to another instrument on board the Mars Reconnaissance Orbiter to analyse the chemistry of the mysterious RSL flows. 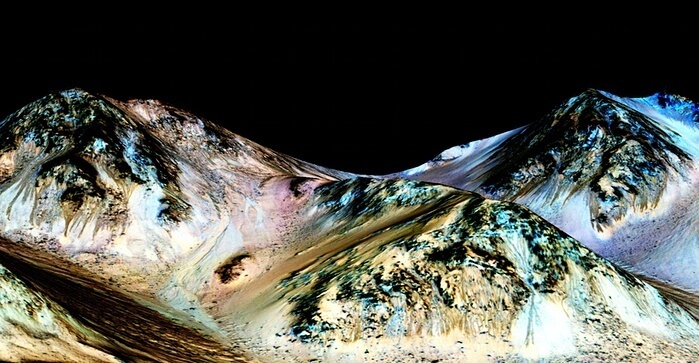 Lujendra Ojha, of Georgia Institute of Technology in Atlanta, and his colleagues used a spectrometer on the MRO to look at infrared light reflected off steep rocky walls when the dark streaks had just begun to appear, and when they had grown to full length at the end of the Martian summer. Writing in the journal Nature Geosciences, the team describes how it found infra-red signatures for hydrated salts when the dark flows were present, but none before they had grown. The hydrated salts – a mix of chlorates and perchlorates – are a smoking gun for the presence of water at all four sites inspected: the Hale, Palikir and Horowitz craters, and a large canyon called Coprates Chasma. The flows only appear when the surface of Mars rises above -23C. The water can run in such frigid conditions because the salts lower the freezing point of water, keeping it liquid far below 0C. For now, researchers are focused on learning where the water comes from. Porous rocks under the Martian surface might hold frozen water that melts in the summer months and seeps up to the surface. Another possibility is that highly concentrated saline aquifers are dotted around beneath the surface, not as pools of water, but as saturated volumes of gritty rock. These could cause flows in some areas, but cannot easily explain water seeping down from the top of crater walls. A third possibility, and one favoured by McEwen, is that salts on the Martian surface absorb water from the atmosphere until they have enough to run downhill. The process, known as deliquescence, is seen in the Atacama desert, where the resulting damp patches are the only known place for microbes to live. The Martian and Nasa – a coincidence too good to be true?